Crossposted from the Citizen Lab blog. Data collected from Oman shows that web filtering applied by India-based ISPs is restricting access to content for customers of an ISP in Oman. While unusual, content filtering undertaken in one political jurisdiction can have an effect on users in another political jurisdiction as a result of ISP routing arrangements - a phenomenon known as "upstream filtering." Content found to be filtered includes news sites, political blogs and file sharing sites. Some variability in filtering was documented, potentially linked to certain measures to loosen filtering regulations in India. The OpenNet Initiative1 (ONI) has investigated Internet filtering and surveillance practices since 2003 and has documented national-level filtering of the Internet in over forty countries.2 Traditionally, such filtering is implemented by Internet service providers (ISPs) at the request of governments for the purpose of restricting content available to domestic audiences. In general, conventional web filtering is designed for exclusively domestic impact, though other forms of content control, such as takedown requests, may affect access across borders. Data was gathered for this research from a number of sources. Access to the Omantel network was obtained through publicly available proxies and through testing undertaken by individuals located in Oman who are customers of Omantelís service. An automated process was run that attempted to access a list of several hundred URLs suspected to be blocked. The results of this process were analyzed to identify blocked content. The URLs that were identified as blocked were then manually confirmed by testers in Oman. Lists of content suspected of being blocked were gathered from a number of sources. First, content suspected of blocking in past ONI testing in India was compiled. Second, Anonymous India made public a list of allegedly blocked URLs that the group claims were obtained by hacking of Indian ISP Reliance.14 This list of content was also added to the list of tested URLs. Testing conducted on June 18-19, 2012 through an Omantel proxy confirmed that Omantel continues to filter the content categories found in previous ONI testing. This filtering is done transparently, as users are presented with an explicit block page as seen in Figure 1 when they attempt to access banned content. The text of this block page is consistent with numerous reports of block pages employed in content filtering in India.15 A list of several hundred URLs was then tested, with 41 of these found o display the block page seen in Figure 2 (the "India block page"). These URLs were also accessed from the Citizen Lab in Toronto, with no sites found to display the block page text seen in Figure 2. Many of these URLs are sites dedicated to Indian and Pakistani culture and entertainment, including file sharing sites with links to Bollywood movies and Indian and Pakistani music. Others are blogging platforms or media/free expression sites. The URL http://www.indybay.org is the website of the San Francisco Bay Area Independent Media Center, while http://www.bloggernews.net/124029 is a blog that discusses Internet censorship in India. A number of factors lead to the conclusion that this is in fact upstream filtering in Oman as a result of content filtering in India. First, the block page seen in Figure 2 refers to the ëDepartment of Telecommunicationsí; Indiaís telecommunications regulator is called the Department of Telecommunications,16 while Omanís sector is regulated by the Telecommunications Regulatory Authority.17 Second, traceroutes of attempts to access blocked content demonstrate that traffic passed through India, as shown in Figure 3. In this trace route, it can be seen in hop #9 that traffic from Oman, where the URL was requested, to the hosting provider in the United States, passes through Bharti Airtel in India. This website, which is an Indian music and movie download site, was blocked with the India block page in Oman. While the passage of network traffic through another country is not in itself unusual, the return of an India block page in Oman would not occur without the passage of network traffic through India. These experiments were run over multiple days from June 18-28, 2012. Testing up to June 24 found that the above list of URLs was blocked consistently. However, testing after June 25 revealed some variability in the results. Testing conducted through a public Omantel proxy on June 25 found that none of the URLs listed above were blocked with the India block page. This result was confirmed by an Omantel user in Oman, who found that none of the URLs listed above were blocked. These results were again confirmed by additional proxy testing on June 27, 2012. It should be noted that this change in filtering behaviour followed a June 22, 2012 ruling by Indiaís Madras High Court, which modified a previous court order regarding blocking of websites through which certain Bollywood films were shared. The new ruling requires ISPs to block the pirated content on a per-URL basis rather than restricting access to an entire site.19 It is plausible that a loosening of filtering in India as a result of this court order was reflected in upstream filtering in Oman. However, testing conducted through an Omantel proxy on June 28 again confirmed many of the URLs listed above blocked with the India block page. There are a number of possible explanations for this variability in behaviour. First, it is possible that factors including how Omantel routes traffic, and the network status of available routes at the time of testing, may cause packets from Omantel to take a different path to their destination that does not pass through a filtered connection from India. If this is the case, it is possible the change in filtering seen in Oman that coincided with the Indian courtís ruling on filtering was merely a coincidence. Second, it is possible that filtering in India is not consistently applied at all times, a trend seen in other countries. The majority of testing results referenced here were gathered from the use of public proxies in Oman. While testing was done with IP addresses registered to Omantel, it remains possible that this proxy connection provides connectivity that does not reflect the experience of the average user in Oman. However, the results found through the proxy were confirmed by individual users of Omantel on multiple occasions. The practice of upstream filtering raises a number of questions, including jurisdictional issues and the lack of recourse available to users in Oman. The application of filters in India restricts Internet users in Oman from accessing content, potentially even content produced in Oman itself, as a result of actions taken for domestic purposes within India. Users in Oman did not consent to this blocking, are left with little recourse for challenging these actions, and have limited means of accessing this content, which may or may not be in violation of Omani regulations. Combined with the significant filtering implemented by Omantel itself, this practice places Internet users in Oman behind multiple layers of national-level filtering. We would like to thank Bennett Haselton of Peacefire.org and Circumventor.com, as well as Riyadh Al Balushi, for assistance with this research. oman_block_social - An Omani block page that specifies that the blocking was due to "societal and cultural norms of the sultanate." 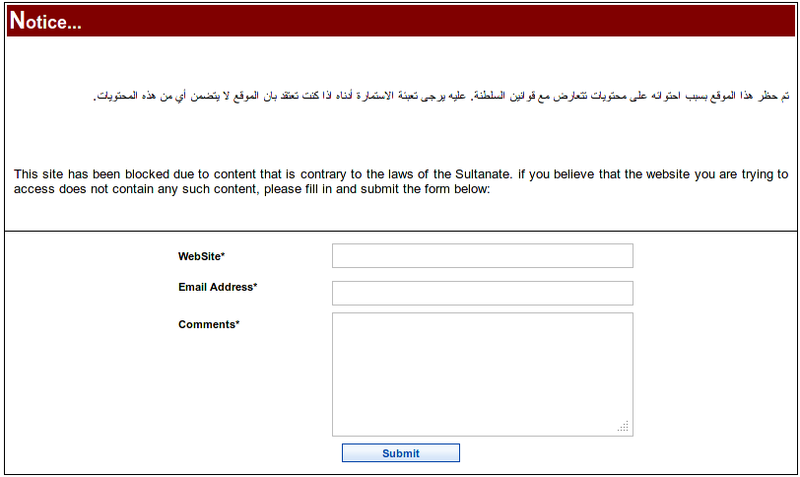 oman_block_laws - An Omani block page that specifies the reason for blocking was a violation of the law. india_block - An Indian block page that specifies the reason for blocking was a court order. The presented zip file contains the html contents and headers returned during the course of this test run. To view this data, extract the zip file and open the contained index.html. Please exercise caution when following any links in this file, as the file contains contents of website data returned and we can make no guarantee as to what these sites contain. This data is presented for informational purposes only and we make no claims regarding the ownership of website content. There were two redactions made in the data. The IP numbers of proxies used were obfuscated and the website contents of the site songdad.com were removed, due to the fact that during the time of testing this site contained the JS/Blacole exploit kit. 1 The OpenNet Initiative is a collaborative partnership of three institutions: the Citizen Lab at the Munk School of Global Affairs, University of Toronto; the Berkman Center for Internet & Society at Harvard University; and the SecDev Group (Ottawa). Research, analysis, and writing of this report was undertaken by the Citizen Lab. 3 Peering is the name of an agreement whereby ISPs agree to station hardware in the same location for a mutually beneficial transfer of data. 4 Transit agreements are agreements in which ISPs allow data from another ISP to move through their infrastructure or network either by consent or for a fee. 9ASN stands for "Autonomous System Number" and refers to a collection of routing prefixes (groups of IP addresses) that are under the control of a single network operator, company or actor.